I was glad when I received tenure in LAUSD. I was also surprised. As a new teacher in LAUSD, I had no idea I was under evaluation for tenure until that moment. Suddenly, the code on my paycheck changed, notifying me I’d been granted the permanent status known as tenure. I’d been pursuing my teaching certification while I taught in LAUSD. Shortly after receiving my certification, I also got tenure. Earning my certification and receiving tenure so close together made me immediately question the timing and rigor of the tenure process. As a teacher in LAUSD for nearly 20 years, I understand why teachers need tenure. Teachers can be at odds with the school or district administration, and they need to be able to advocate for their students without fear of losing their jobs. While I highly value tenure for this reason, the process of achieving it should be adjusted to provide enough time for teachers to undergo a thorough evaluation of their skills and potential. Under the current process, school leadership is expected to make a tenure decision (technically called “permanent status”) after evaluating only 18 months of teaching. In these first couple of years, teachers are still learning basic classroom management and are constantly making adjustments to their teaching style. They are also likely being mentored by veteran teachers in the school. Finding a teaching style, learning from peers, and making changes in the classroom all take time. As a result, it’s normal for many teachers to feel insecure in the first two years. Instead of rushing teachers through the tenure process during those early years, our profession needs to focus on mentoring new teachers. After two years of teaching, teachers have only started to apply what they are learning from their peers and to find their voice in the classroom. Teachers need more time to solicit, absorb, and apply feedback. Personally, I needed three years before I felt secure in the classroom. An extended tenure process focused on growth and development would also allow our schools to create stronger mentoring systems to retain teachers over the long term. As it stands, unfortunately, we do a poor job of retaining new teachers; many leave the profession within the first three years. Our current tenure process does nothing to mitigate this turnover. But if given more time to receive feedback and work with their mentors, new teachers could feel supported as they navigate those challenging early years. This would not only help new teachers go on to become effective educators but would also increase retention. Right now, confidence in public education is low, and we are facing a looming teacher shortage. As educators, it is our responsibility to restore the public’s faith in our education system and to elevate the prestige of our craft. And California now has the opportunity to do just that. Assemblymember Shirley Weber, a seasoned educator herself, worked with teachers to author legislation that would move tenure from two to three years and allow for an optional fourth and fifth years for teachers still working to hit their stride. A longer, more meaningful tenure process that is focused on growth and development is an important step in the right direction for teachers, as well as the students and communities we serve. 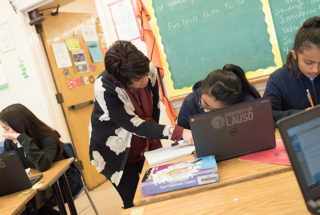 Phylis Hoffman, a second-grade teacher at Harry Bridges K-8 Span School in the Los Angeles Unified School District, is in her 25th year of teaching. She is National Board-certified, a part of numerous leadership teams in her school, and a member of Educators 4 Excellence.